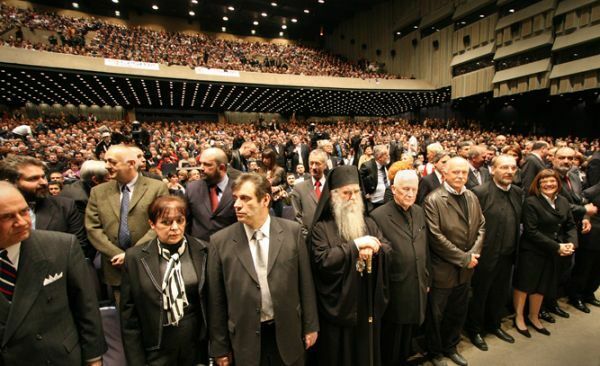 Belgrade, Serbia - The ten year anniversary of the NATO agression on the Federal Republic of Yugoslavia and the Serbian people was commemerated on the evening of March 24, 2009 with the national academy “Serbia, Remember” in Belgrade's Sava Center. Speaking at the academy were Patriarch Pavle's representative, His Eminence Metropolitan Amphilohije of Montenegro and the Coastlands, Dr. Vojislav Kostunica, academic Matija Beckovic, executive for the Center of Clinical Radiology in Serbia, Dr. Radomir Kovacevic, and Branimir Nesic. Metropolitan Amphilohije stated that the bombings were planned in advance in order to take the vital part of Serbia and as a result, to proclaim a false state. The Serbian people must not forget that crime and resist with all their being the consequences of that crime, said the metropolitan who, on this occasion, recommended that a commemorative center be opened where all names of those who suffered during the NATO bombing would be written. Former Serbian Prime Minister Dr. Vojislav Kostunica noted that Serbia remembers and does not forget that NATO is the true name of the independent state of Kosovo and that on that part of Serbia's territory, with the seizement and pillage, first a physical then a legal oppression was committed in an attempt to establish the first NATO state, which for Serbia will never exist. Our greatest responsibility, said Kostunica, is to be witnesses of the truth that Kosovo is Serbia, that it was, that it is and that it will remain ours. Kosovo has once and for all times been built in the foundations of the Serbian state, said Kostunica. The academic, Matija Beckovic, also spoke at this academy which was dedicated to the public at large. He supported the initiative to erect a memorial center dedicated to the bombing victims and for the Serbian Orthodox Church to take responsiblity of this. This is done by all the other people of this world, added the famed Serbian poet. Branimir Nesic, the editor in chief of the Dveri Srpske magazine, addressed the public with the following words: When will we Serbs finally learn our lesson which the Western powers have been teaching us for centuries? When we will learn the lessons they have been teaching us in the twentieth century when during WWI, due to the Serbian idea of freedom, they sent us a painful expidition which killed a million people; when, during WWII, with their cold cynicism they betrayed the democatic-minded Serbs who were the first European movement of resistance; when in the 90s they attempted to free us from ourselves, - us, that is, the incapable ones who are unable to absorb and accept their morality and justice, - and so they bombed us twice in the last decade and who knows which time it was in the twentieth century? When will we learn the lesson that every Serbian attempt at building our own allotment will be punished with blood? When will we learn our lesson that we must reject that which we were, are and what is ours if we desire to be a part of them, as certainly as their dependent? Today is the right time to answer them whether we have learned our lesson. And the answer is: such a lesson the Serbian people will never learn! This is a lesson that they will have to grasp, stated Nesic. "I came in order to say, we are united," said the President of the Foreign Affairs of the Russian Duma, Konstantin Kosachev, who finished his speech with the words, "Kosovo is Serbia." According to him, those that bombed Serbia also bombed the United Nations. A letter from Patriarch Kirill of the Russian Orthodox Church, addressed to Patriarch Pavle of Serbia, was read in which he states that the pain of the brothers in Serbia is the pain of the entire Russian Church. "And in the future the Russian Church will use all possible occasions to raise its voice in protection of God's justice, in protection of our Orthodox brothers and sisters from the Kosovo-Metohija area of Serbia, both those that are there as well as those expelled, in protection of all victims of violence and in protection of the brutal violation of justice," said Patriarch Kirill in the letter. Addressing the public was also the Russian filmmaker Nikita Mikhalkov. Also on display in the Sava Center was an exhibit of photographs taken during the bombing. The Academy was organized by the Slobodan Jovanovic Fund, the Active Center and the Serbian Assembly Dveri.